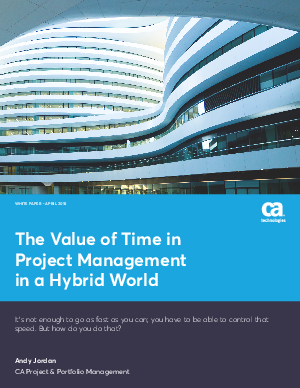 Speed is increasingly becoming the most important factor in project execution for a modern business. Of course, it has always been important to deliver projects as quickly as possible—that’s why schedules were developed and managed to. But historically those schedules were usually rather arbitrary. Today, things are very different. Customers expect more functionality more quickly than ever before, and they are unwilling to tolerate delays or missed commitments. Organizations have recognized the importance of minimizing time to delivery, seeking to leverage opportunities and solve challenges in as little time as possible, but in doing so they have frequently forgotten one critical aspect. They aren’t actively managing those time horizons—they are simply careening headlong toward the end goal. That can introduce significant problems, and that’s what we want to look at in this white paper.